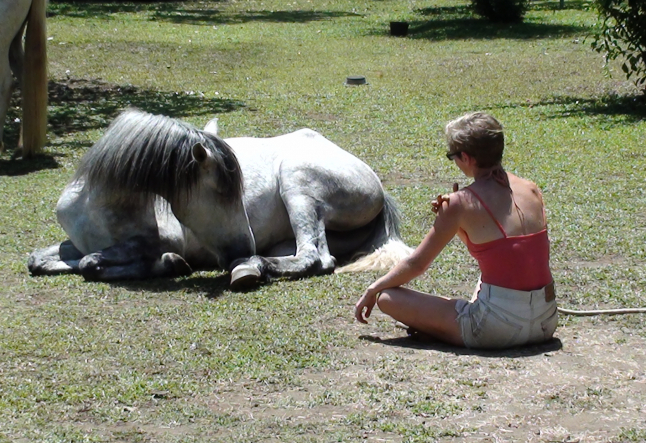 You can apply the Yamas of Yoga to your training sessions with your horse with awareness and a little imagination. Originally the Yamas were developed to help people clear the path for their own self discovery journey. By applying these same principals to your horse you and he will communicate more clearly and honestly. Any interaction with your horse is a mixture of herd behaviour, which automatically includes the concepts of alpha and hierarchy and the union of your two spirits, which is a concept of yoga and meditation. Horses are prey animals and herd animals. They look to their alpha to keep them safe and comfortable. As prey animals they are always alert and looking for potential danger. As the trainer it is up to you to earn an alpha position within your herd, or in relation to your horse. There are many books and web sites devoted to this topic. Recently I learned and read about the author and horsewoman, Carolyn Resnick, who has written Naked Liberty. In it she recounts her experiences with a wild horse herd and how she was accepted into the hierarchy of the herd. thus I began to earn a higher status in his eyes. Yoga means union. The Yamas, codified by Patanjali, offer us guidelines to realize union of mind, body and spirit within ourselves and with the world around us. Yamas are simple admonitions of social behaviour. Ahimsa translates to mean non-violence. Don’t hurt others in word or deed, don’t harm the environment, and don’t hurt animals. In your own yoga practice be aware to practice ahimsa on yourself and don’t go beyond your limits until you are ready. In interacting with your horse be aware of his limits, physical and emotional. Having knowledge of his true nature and capabilities ensures that you will always practice ahimsa. For example, when my gelding first came to me he was green from the pasture and 4 years old. He was frightened of cement having known only pasture and soft footing. We gently urged Half-Pint to experience the cement of our drive-way as he made his way from stable to pasture twice a day. Acknowledging his fears and inexperience with cement was our way of practicing ahimsa with him daily. Means don’t tell lies, or un- truths. This is a simple concept that all societies and religions subscribe to. Let’s take a deeper look at the meaning behind Satya; when we tell a lie we hurt someone and maybe ourselves so the deeper meaning of Satya is to not hurt others by lying. We can then say telling a “white lie” if it is said in order to spare someone greater hurt is allowed and encouraged. Yoga asks you to use your intellect as you practice the Yamas, don’t blindly just follow yogic concepts. In our interactions with our horse observing Satya is important because horses are intuitive beings. Anyone who is around horses in any capacity knows this truth; horses are in tune with our emotions and energies, whether we are riding them, walking next to them, or in the same pasture with them. “Tricking” (let’s say lying in this case) your horse to learn or act in a certain way is a short-term solution to training and potentially counter-productive. Do your best to be honest with yourself and your horse when you are in a training session. For example in my experience (and I know this may run counter to others’ beliefs and experiences), I don’t like to hide the rope and halter behind my body when I go to fetch my horse. You are not practicing Satya and respect for your horse if you hide your intentions from him. You are confusing him with opposing thoughts and actions. In his mind you are holding something behind you that could be dangerous but at the same time you have this soft gentle look on your face that signals all is well. Instead I prefer to let him know with voice and body language that I am asking him to come and play/work with me and put aside his current pastime, most often eating or sunning in the pasture. Of course this does not mean you enter the pasture and head straight over to your horse with a gleam in your eye. Be respectful of horse behaviour. Enter the pasture and meander a little bit, look him in the eye and then look away. Show him the halter and rope. With time your horse will come to you and in the meantime, just gently make your way to him, never walking in a straight line. Alternate looking at him and then looking away. Remember horses are prey animals. When a predator is stalking them they oftentimes make a straight line for them and eyes always on them. You do not want to mimic predator behaviour. Asteya means non-stealing; don’t take something that does not belong to you. This concept can be expanded to include not taking someone’s pride away from them or their happiness. In a broader sense asteya means not to over-consume. When we over-eat, when we water our lawns in a drought situation, when we don’t turn lights off in an empty room; these are all examples of not observing asteya because we are using and wasting resources that someone else may actually need. In training our horse asteya is manifested in our intentions and behaviours toward our horse. When we practice Yoga with our horse we are not trying to “break” him or dominate him. We do not want to take anything away from him. Our goal and the goal of any horseperson is to join with our horse to make something bigger than the two of us individually. For example, the play sessions with Half-Pint where I helped him deepen his own sense of self-confidence and curiosity to play with the big blue exercise ball was a fun way to give rather than take anything away from Half-Pint. I did not force him to accept the ball. Instead I gave him a safe environment where he could explore the ball by himself, in his “horsey” way and I was there just to give moral support if he needed it. Over a few days we played with the ball, me on the ground and gently offering the ball to him to sniff, mouth, and discover kicking it all over the arena. He learned not to over-panic when the ball would bounce back from the arena’s sides and come towards him. Later we both had fun, me riding Half-Pint and him kicking and following that blue ball all around the arena. The expanded lesson learned is now Half-Pint lets his natural curiosity come to the fore when discovering new things in his environment rather first thinking to run from them. Bramacharia means to not over-indulge. This can be translated to mean chastity, and or self-discipline to not practice instant self-gratification. On the yoga mat we have all experienced a sense of well-being and achievement in practicing a certain asana or pranayama. It is natural to want to experience that again. However, our bodies, both physically and emotionally, are in constant flux and it may not be the best thing for your body on a certain day to do that particular asana, no matter how much you want to perform it. Learning how to listen to the messages our bodies are telling us and to use our intellect and follow bramacharia in those instances in a powerful lesson Yoga gives to us. The same is true with your horse and his training. Horses have personalities, physical and spiritual energies, and emotions just like we do. It is up to you, as the alpha in the relationship to be sensitive to his needs and moods and to put his comfort above your training schedule. This concept is very easy to illustrate using training examples. We have all seen, unfortunately, brutal training methods. These are examples of not observing bramacharia. The trainer wants certain behaviour from the horse and uses pain and fear to achieve it, thus the trainer is indulging in instant self-gratification. I, in my ignorance, have not always practiced bramacharia with my horses. As I have learned by experience and from teachers and self-study I try my best not to repeat those training mistakes. When Half-Pint came to us he did not know about halters and reins. I do not use bits on my horses, (not for 10 years now), however I did take the advice of someone else and put a very tight noseband on Half-Pint to control him, through pain, when he first arrived. I was trying to get instant results by dominating Half-Pint rather than understanding his behaviour. As most horsepersons know, this did not work. And so I began to work with Half-Pint with a loose halter, in a safe environment for me, that being my outdoor arena. With patience, never expecting anything from our sessions (this is karma yoga), I began to learn how to communicate with Half-Pint and understand the signals he was giving me and vice-a-versa. I was looking to communicate with Half-Pint now rather than command him. We now ride together with a very loose halter and someday I hope we can ride without halters or reins. Aparigraha means to not covet. Do not yearn for things that belong to others. Learn how to be content with what you have. However this does not mean be lazy and never plan for the future or have goals for self-improvement. To covet someone else’s material things or someone else’s fame is to not be aware and appreciative of your own gifts. The practice of Yoga and the observance of aparigraha help us learn self-awareness acknowledgment of our own beauty, strength, and gifts for giving. On the yoga mat try to constantly look inward at your own yoga journey rather than compare yourself to the person next to you in class, or to your own self the day before. Each day is like a gift for you to experience your individual path. In your interactions with your horse open your heart to your horse. He is always observing aparigraha in his relationship with you. He does not covet anything you have, he simply wants to be understood by you and forge a bond with you. In my time with Half-Pint, and all the other horses I have been blessed to have in my life this is an immutable truth. My precious Divina, a 15 year old abandoned Criola mare came into my life, sick, starved, and frightened. We did not want to compete or compare ourselves with competition horses; we just wanted to spend time in each other’s company in the pasture and on the trail. She taught me the joy of living in the moment. When we observe aparigraha we are setting our souls free of limitations and we are open to the beauty of Yoga; the union of all things.